Rendezvous Bay is my favorite beach. 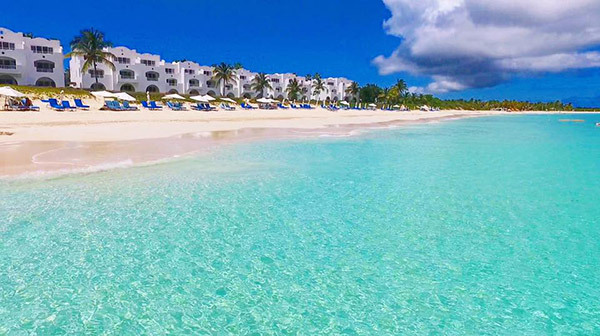 Not just my favorite Anguilla beach, but my favorite beach in the world. There is no better, in my opinion. 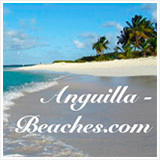 Rendezvous Bay Anguilla sits on the south western side of Anguilla and is a semi-circle of perfection. 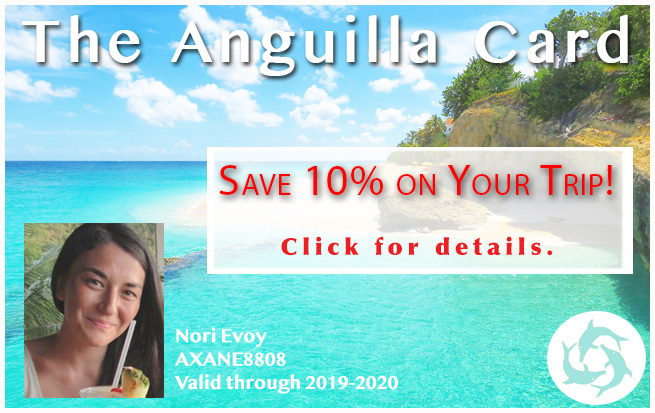 Crazy as it sounds, I felt drawn to it before I ever set a foot in Anguilla. 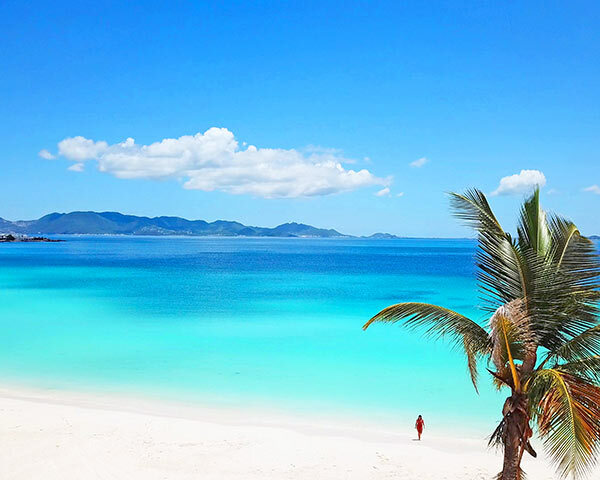 I had a dream of being in the sea at Rendezvous Bay. I could distinctly feel the silky sand beneath my feet and the satiny cool water, dense around me. The most brilliant color of blue for miles. 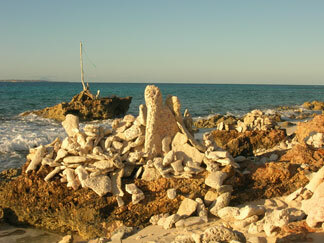 Amazingly enough, this is exactly what I found when I stepped foot on Rendezvous Bay. at work, by beachwalkers at "Little Stonehenge"
Rendezvous is usually very calm however it varies a bit from end to end. Each section provides its own special powers of beauty. 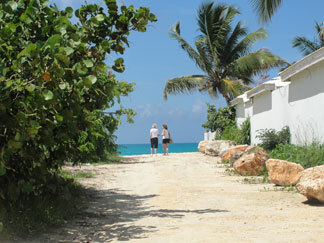 On this walk, I start at the western end and walk to the eastern end of Rendezvous Bay. 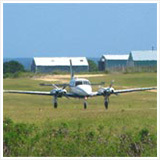 The western end, by car, is most easily accessed if you turn down the road to CuisinArt Golf Resort & Spa and The Dune Preserve. Go past the entrance to CuisinArt, and you will arrive at Bankie Banx's Dune Preserve. My favorite way to access and experience a vista of Rendezvous is at the western end, at Bankie Banx's Dune Preserve, rated the #1 beach bar in the world by CNN. Bankie is a local celebrity musician and welcoming host. 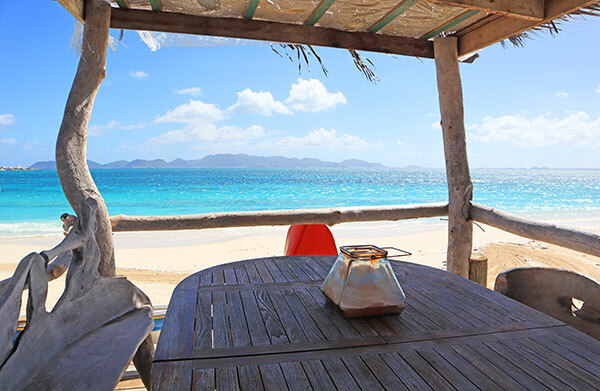 "The Dune" is an ideal spot to sit and have a drink, eat some lunch or dinner and take in the panorama of Rendezvous Bay with St. Martin in the background. It is a genuine breath-taker. 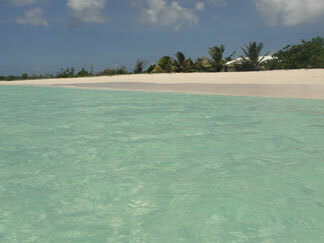 If you walk to the right from The Dune, you will reach the western end of Rendezvous Bay. You will be able to see The Reef over the dunes to the right. That end of the bay ends around some rocks and is the more rugged end of the bay, if you can call any part of Rendezvous rugged. 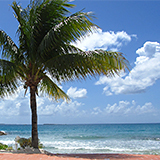 Walking back to the left, back past The Dune Preserve, you will be heading in the direction of CuisinArt, you can't miss it. 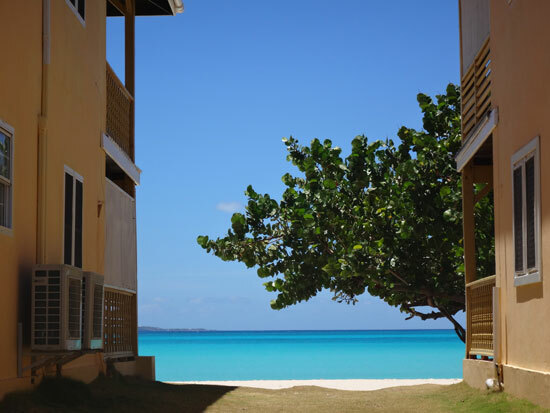 CuisinArt Golf Resort & Spa is the higher-end property that sits on Rendezvous Bay. 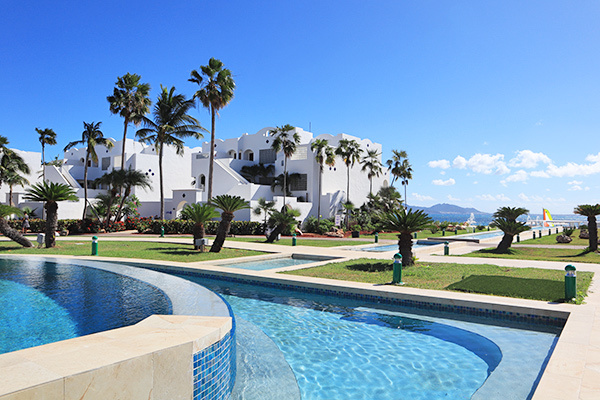 It's Mediterranean-style, white buildings stand out as they line the beach. 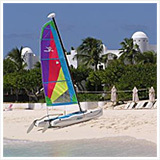 CuisinArt will also have plenty of chairs and umbrellas set up on the beach for their guests, as well as some fun sea gear like Hobie Cats, kayaks, and floats. 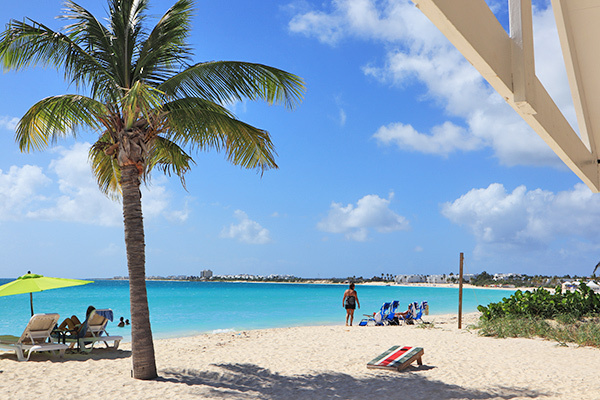 CuisinArt features a nice beach bar, right on Rendezvous Bay. 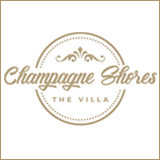 If you go inside the resort, there are incredible dining options for lunch and dinner. More on CuisinArt and its dining here. After you've passed CuisinArt there is nothing until you reach the Sunshine Shack. 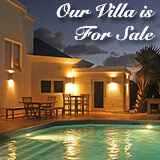 It is a stark contrast to the luxurious CuisinArt setting in that it is a little shack right on the sand. Very unpretentious, very casual, and very cute. Many people spend the day here. The owner, Garvey, is a terrific bartender and a fun person to be around. Garvey is in a great spot, on an amazing beach, and you are guaranteed a great time if the Sunshine Shack is your destination. Sit back and enjoy the view! 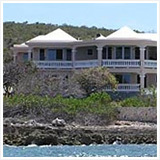 Not too much farther on down the beach from the Sunshine Shack is The Anguilla Great House, aka Great House. 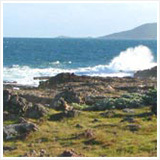 It is the quaint and moderate accommodation on Rendezvous Bay. 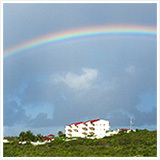 Anguilla Great House has a restaurant and they serve breakfast, lunch, and dinner. 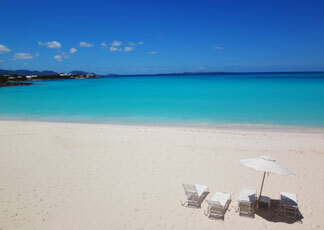 This is a great spot to "set up camp" for the day if you are not staying on Rendezvous Bay. Their lounge chair rental (no umbrellas) is a fair price at $5 US per person. If you didn't bring your lunch with you, can eat there, walk to the Sunshine Shack, walk to CuisinArt, or The Dune Preserve for refueling! 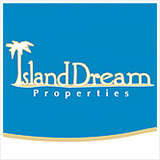 The Great House property joins the beach with a line of beautiful palm trees for that ultimate nap on the beach scenario. Also at this spot is another good and easy way to access Rendezvous Bay if you aren't staying on this particular beach (see the photo above), and just want to walk the beach. Follow the signs on the main road down to Great House, and then hang stay left until you see a rather large parking lot. The walk to the beach from the parking lot is minimal and before you know it, your toes are in the sand. If you can tear yourself away from the willowy palms at The Great House, the rest of the stretch is home to Rendezvous Bay Hotel and The Place restaurant. The Rendezvous Salt Pond starts just on the other side of the sand and runs almost the rest of the length of the beach. The Place restaurants sits right in front of the pond and on the sands of Rendezvous Bay. It is a charming building, wooden and painted white. 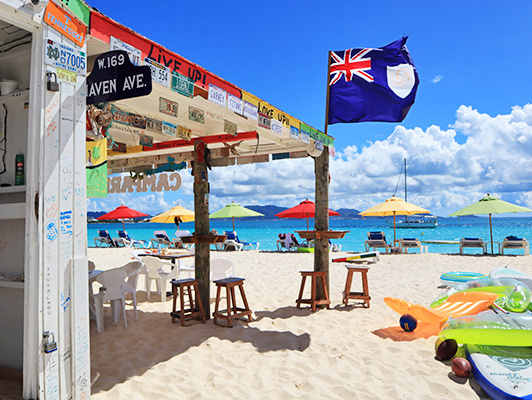 Some of the tastiest beach eats are served up here, and it is one of the prettiest parts of Rendezvous Bay. Look out to your right, to the sea, you can still see St. Martin from this side of the bay and on a clear day you can see the island of Saba. 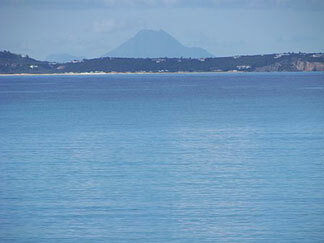 Saba will appear on the other side of St. Martin (the flat part) and looks like the volcano that it is. If you are curious, you can read much more about Saba here. As you continue, you will notice that typically the water seems to lap the shore more like a lake on the eastern half. It is very calm and makes for easy swimming. The next and last set of buildings you find is the Rendezvous Bay Hotel, just next to The Place restaurant. 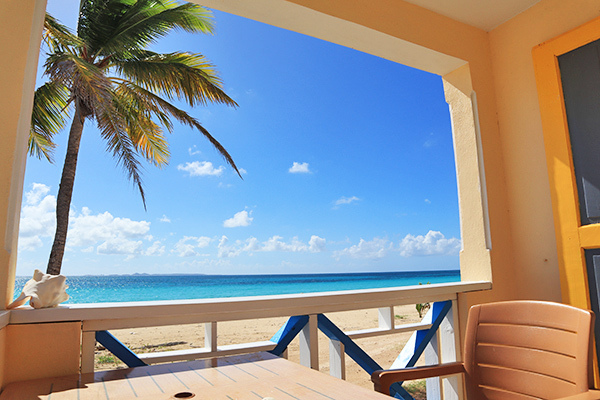 This was the first spot I ever stayed when I started coming to Anguilla. I loved every single thing about it. All these years later and the stretch of beach in front of this property is still amazing as is the entire wonderful expanse of Rendezvous Bay. Rendezvous Bay Hotel rounds out the end of the beach. The beach may stop, but the bay continues on around a bit farther. 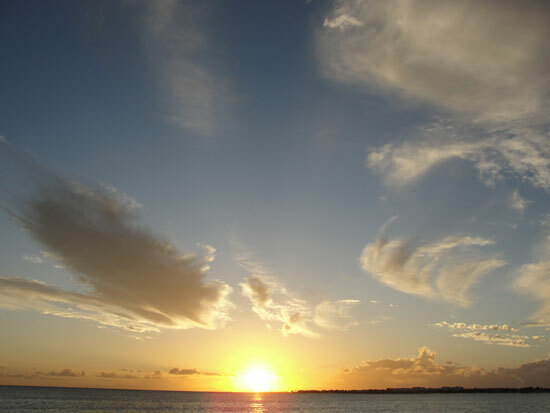 this is "Where the sunsets heal your soul." I believe it to be true.